Angel Blanco Granja is from Spain. He received his Bachelor Degree in Telecommunication Technologies Engineering from the University of Valladolid (UVa), and his Master Degree in Telecommunication Engineering from the Technical University of Denmark (DTU). He was awarded with an exchange scholarship on two occasions. 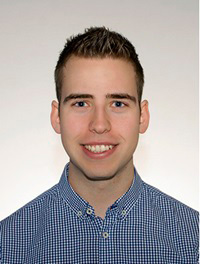 The first one, with an Erasmus Scholarship he completed his Bachelor Thesis entitled “Study of a coherent receiver for optical communications” as an exchange student at the Department of Photonics Engineering at Technical University of Denmark (DTU). During his master at DTU he obtained a scholarship to study one semester abroad, at the Rensselaer Polytechnic Institute (RPI) in the USA. He completed his Master working for the start-up Bifrost where he wrote his Master Thesis entitled “Technologies for Next Generation Optical Fiber Access Networks”. In those years, Angel acquired a background in telecommunication technologies such as electronics, photonics, mobile communication, signal processing, software development and networks. Additionally, he also assisted to courses related with business and entrepreneurship. Angel joined the Institut für Mikrowellentechnik und Photonik at Technische Universität Darmstadt (TUDa) in October 2016 where, in collaboration with the Technische Hochschule Mittelhessen (THM), he pursues his PhD. His PhD project aims at developing a new generation of Schottky diode-based microwave detectors which can enhance the current State of the Art. Within CELTA, the microwave detectors he designs will take part in the beam-steering demonstrator at DTU.